When generating wind loads, some external pressure coefficients have a value of 0. What is the reason for this? For duopitch roofs with a roof iclination of > 5 °, the roof areas F, G, H, I and J have to be separately classified according to the windward and leeward side. For the wind direction of 0 ° (wind in longitudinal direction), positive as well as negative aerodynamic coefficients have to be taken into account for roof inclinations of up to 45 °. 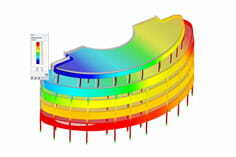 For these cases, this results in a total of 4 possible wind combinations, depending on the building side (see Figure 1). For the wind direction of 90 ° (wind on gable side), however, there are no positive external pressure coefficients for a roof inclination of > 15 °. 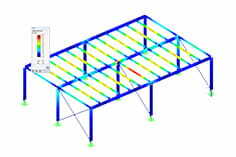 For a building with a roof inclination of 45 ° you would receive 10 possible wind load cases (0 ° = 4 * 2, 90 ° = 1 * 2). Only positive (pressure) aerodynamic coefficients per roof area are used. Only negative (suction) aerodynamic coefficients per roof area are used. Negative (suction) aerodynamic coefficients for the windward side and positive (pressure) coefficients for the leeward side of the roof are used. Positive (pressure) aerodynamic coefficients for the windward side and negative (suction) coefficients for the leeward side of the roof are used. If there are, for example, only negative coefficients for a load position, then only negative loads are applied to the roof surface. Consequently, there is no pressure -> therefore these values are set to 0. A load case, which thus contains only values with the size 0, could also be deselected during the generation. For example, this is always possible, as already described, for the LC w + with a wind direction of 90 ° (gable-sided wind) and a roof inclination of > 15 °.